Roger Williams University, with campuses in Bristol and Providence R.I., is a leading independent, coeducational university with programs in the liberal arts and the professions. Karen Jones Ethier has worked at RWU for more than 15 years, mainly as Assistant Director and then Director of the Media Services department. In 2014 she joined the IT department as Director of Support Services. Her areas of oversight include classroom and event support (formerly Media Services), helpdesk, and desktop support services. With expertise in both IT and AV, we wanted to learn about her strategies for cohesive and collaborative campus technology. 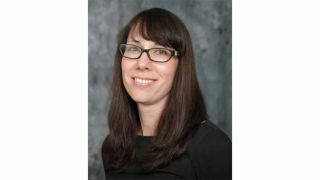 Karen Jones Ethier, Director of Support Services, Information Technology, Roger Williams University, Bristol, Rhode IslandAV Technology editors: How is AV/IT convergence playing out in your facility? Karen Jones Ethier: We have seen tremendous growth in demand for web conferencing and video streaming, which has created a pressing need for equipment, training, and a plan to manage, store, and disseminate content. Another area of growth has been digital signage. A few years ago, this meant a computer connected by VGA to a TV and playing a PowerPoint in a loop. Now, we have content managers across campus (or anywhere they have an internet connection) creating, accessing and scheduling dynamic content including room schedules and social media feeds. Karen Jones Ethier: Our recent interesting projects have included designing web conferencing classrooms and a multipurpose space in our Library Learning Commons that supports and promotes active learning, presentation, and collaboration. One of the challenges of designing these spaces is to make the technology accessible to everyone who uses the space, from tech-savvy college students to faculty who may be significantly less comfortable. Balancing the support needs for these spaces has been a challenge, but luckily we have really committed, smart technical support staff who have been able to make these spaces successful. Karen Jones Ethier: First, we’re hopeful that in the next few years we will be able to replace our older classroom systems, many of which are analog and which were installed at a time we weren’t envisioning the technology possibilities of today. In particular, we would like to enable more rooms with Crestron AirMedia and build more spaces that are web conferencing or streaming-ready. We would also like to expand our digital signage system to further enhance campus communication. How to you procure/purchase your AV for in-house installs? Karen Jones Ethier: We purchase equipment either through a distributor or through our AV vendor. Our department has some great relationships with our vendors and manufacturers, which has allowed us to complete some great projects in the past few years, including campus-wide VDI and large-scale deployment of digital signage and collaborative displays in classrooms and public areas. Karen Jones Ethier: Like other schools, we are currently struggling with maintaining our analog systems until we have funding to totally rebuild them because they are totally obsolete. Our administrators are (rightly) asking “Hey, didn’t we just spend a bunch of money to outfit these rooms? Why do we need to start all over every 7-10 years?” Manufacturers could/ should do more to help customers to upgrade their aging systems without having to start new. Another missed opportunity is to provide better “out of the box” solutions for smaller classroom or conference setups. We are often cobbling different manufacturers’ equipment together, which leads to incompatibilities and other issues. Karen Jones Ethier: An obstacle has always been that AV was not really considered to be part of IT! Our Classroom and Event Support group was reorganized into the IT department a few years ago. Before we reorganized into IT, the AV/IT convergence was sometimes a struggle as our technicians didn’t always have the resources or tools necessary to maintain and support the newer technologies. Joining IT gave us the support and training opportunities necessary to keep up with the field. I have a strong relationship of collaboration with the IT Director who oversees network and infrastructure, which is really beneficial to managing projects together. Award-winning architect Ole Scheeren will present the Integrated Systems Europe Opening Address on February 6, 2017, less than 24 hours before the show opens its doors at the RAI in Amsterdam. His speech will provide the culmination of a day of events that will include the Smart Building Conference and the launch of extensive educational programs delivered by leading trade associations CEDIA and InfoComm International. The Smart Building Conference will focus on how “the IoT Makes Smart Buildings Even Smarter.” Visit smartbuildingconference.com for more info.